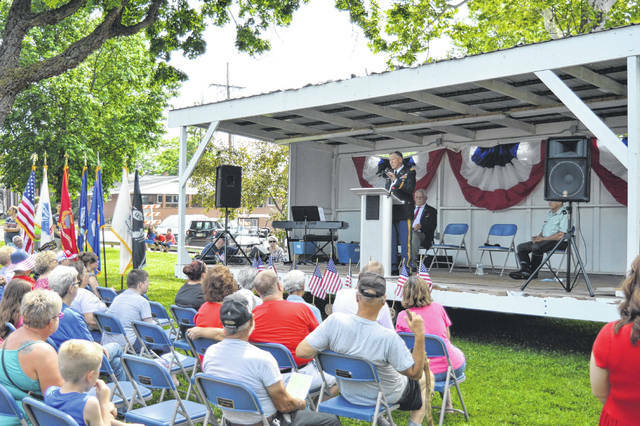 Retired Army Colonel Bob Wetterstroem addresses the assembled in Gallipolis City Park after the Memorial Day Parade. GALLIPOLIS — Area residents gathered in Pine Street Cemetery, along Second Avenue for a parade and in Gallipolis City Park to remember the sacrifices of those who went before to serve their country and fellow U.S. citizens in recognition of Memorial Day. Members of the Cadot-Blessing Camp #126 Sons of Union Veterans of the Civil War held a ceremony in Pine Street Cemetery around 9 a.m. among the graves of area veterans. After community officials, organizations and businesses glided down Second Avenue as part of the annual parade, area residents gathered around the stage near the Doughboy War Memorial in City Park to listen to retired U.S. Army Colonel Bob Wetterstroem as well as the names of veterans who passed between last Memorial Day to the current. Wetterstroem is a graduate of several U.S. Army Schools including Airborne, Ranger, Command and General Staff College and the Army War College. He remains active in the Major Samuel Woodfill Chapter and currently serves as Vice President of ROTC Affairs. During his 30 years of service, he spent 18 years in FA assignments including: Battery Executive Officer of three howitzer batteries at Fort Cambpell, Ky., Commander of two howitzer batteries in Vietnam (including all four caliber of FA weapons: 105 mm, 155 mm, 175 mm and eight inch in the Army inventory), Commander of a 175 mm battery in the 5th Battalion of the 28th Field Artillery, Commander of the 5th/28 FA Battalion for four years and Commander of the 428th Field Artillery Brigade for three years. His non-Fa assignments included Deputy Chief of Staff, Training, for the 83rd Army Reserve Command during Operation Desert Shield/ Desert Storm. In that position, he was responsible for the mobilization, training and deployment of 21 units to Iraq, Europe and the U.S. His final assignment was Commandant, 2075th U.S. Army Reserves Forces School. Following his retirement from the Army, Wetterstroem served as Deputy Commanding General with the Ohio Military Reserve for four and a half years. He and his wife Rita Hyle Wetterstroem live in Cincinnati.